The Charleston tour played Crooked Oaks on Sat Jun 3rd down on Seabrook Island. The weather was great, the course was in fantastic shape and everyone seemed to enjoy the golf! The Championship flight saw the return of John Ashmore to the winners circle. John used the four birdies to his advantage as he posted a very nice round of 76 totake top honors by five shots over Jared Bibbee. The A flight also featured another member returning to the winners circle for the first time this year. Tony Walters fired a 76 to edge Kevin Saylor and Glenn Powell by a single shot. Glenn wound up taking home 2nd place money on the scorecard playoff. The B flight almost had a playoff as Hilton Heads Paul Sherry and Tim Sumption were battling it out. Unfortunately for Paul he had a T.C. Chinn which cost him the 2 shots he needed for a playoff. Paul posted an 81 to fall two shots shy of Tim Sumption’s 79. Coming in third place was Augusta’s Ted Turner who stated “this course is definitely worth the three hour drive” The C flight saw Hilton Head’s Noel Coolican win by one shot as he posted an 88 to Jason Courtney’s 89. Charleston’s David Carlson rounded out the top three with 91. 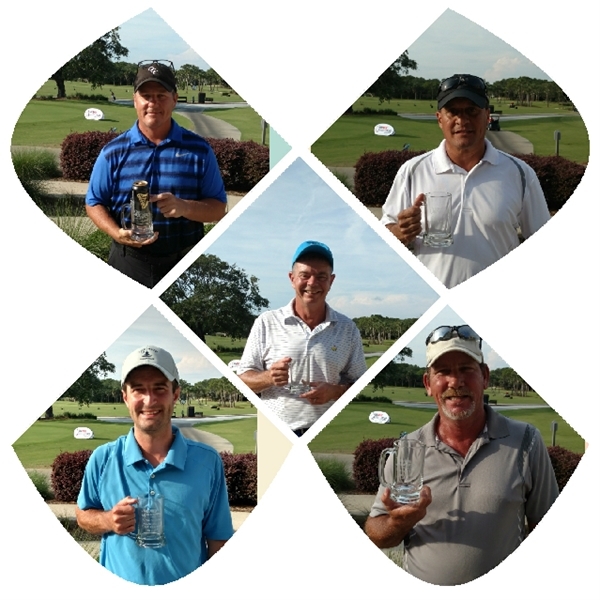 The D flight saw Cowboy grab top honors by cruising to victory with a smooth 91 and finish 8 shots clear of second place finisher Chris hill who took second place money by virtue of the scorecard playoff. Overall it was a great event! Our next event is Wescott Plantation on Jun 17. Please sign up online or shoot me an email if you would like to play.